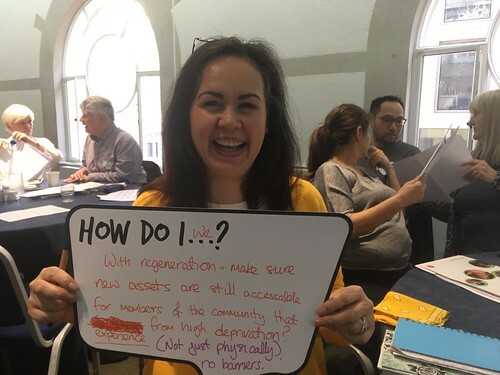 Resources for Change have visited 20 Big Local areas to find out about the impact Big Local is having, and how Big Local partnerships themselves are measuring success. Based on the research, here are 5 impact measurement tips for Big Local partnerships. You need to decide what signs of change you are looking for – these are known as indicators. Is the activity you are supporting a one-off project that will achieve lasting change – or is it something that will need to continue in order for the change to be maintained? Both of these things are valuable. You need to be clear about what the expectations are before you consider what impacts you want to measure and for how long. Although we might be clear what we are trying to achieve by running a particular project, often what people get from it is something completely different that we hadn’t thought of. It’s important to prepare a way to capture this too, to help plan future projects. Record the starting point – or baseline – before you begin your activity. This could take the form of the organisers observing how participants are when they first arrive, or by asking participants to score how they feel on a scale of 1 – 10 and asking them to do this again at the end of the project. Don’t use complicated questionnaires if people have limited time, have literacy problems or may have a first language that isn’t English. Sometimes people don’t like asking other people questions, it seems like a lot of extra work and project organisers often worry that if they are seen as intrusive and that it will put off the people they are trying to attract. But there are lots of other ways of collecting information that can avoid any of these things happening. Find out about some methods other areas are using. Check what information other organisations have already got, if there is information that your partners are already collecting, start with that and don’t duplicate it. If you need people in the projects you are funding to collect information for you, you can provide help for them. Be clear about what information you will want and provide simple and accessible ways that they can collect the information and return it to you (forms, spreadsheets, meetings to talk about what happened). You could offer to promote their achievements through your newsletters, websites etc. – but only when you’ve got the evidence. Once you have collected information about the impact of an event or activity, make sure you analyse it to find out what it is telling you. You might find out things that will help plan your next project. You should always keep a sense of perspective – ask yourselves how much of the change was created by your project/activity – or could it have been affected by something else? Have you solved the problem or have you just moved it elsewhere? If 1000 people attend a summer festival, they will have a great day out; it will promote Big Local and help people feel part of the community. If the event costs £5000, it works out at £5 per head. That can be seen as pretty good value for money. But if you fund an apprenticeship for five young people that costs £30,000, that works out at £6,000 per head – and you have only supported 5 people. However, the level of change that you can create in those two activities is completely different. Those 5 young people could have their lives completely changed by that apprenticeship, but it’s unlikely that anyone’s life will change by attending a summer festival. That’s not to say you should do one thing rather than another – just that you can’t compare them in terms of impact. One really good way of bringing to life the difference your activities are making is to use case studies that tell one person’s experience. Most people respond better to a personal story than to a set of figures. But these stories should be used carefully, with the permission of the person whose story you are telling. Check out the Big Local how to guides on writing case studies or making vox pops. Low key stories about small but significant changes in people’s lives are important and these make great (if less dramatic) case studies. This blog is based on work by Nicky Stevenson of Resources for Change from research into the impact of Big Local. A range of evaluation tools are available in the Big Local programme guidance on plan reviews.